As the PGA TOUR’s CareerBuilder Challenge teed off at PGA West’s Stadium and Nicklaus Tournament courses, as well as at the La Quinta Country Club in La Quinta, Calif., 1963 winner Jack Nicklaus took a moment to reflect on the early days of the event—which was nothing short of a career builder for the record 18-time major champion and the man considered golf history’s greatest. Today’s CareerBuilder Challenge has the marquee name draw of stars like Phil Mickelson, Jon Rahm, Jason Dufner and many others. But a half-century ago, the marquee name was Bob Hope, and the roll call of stars included Nicklaus, Gary Palmer and Arnold Player. It’s also where Nicklaus and long-time caddie Angelo Argea met, played, and won together for the first time. And it’s where Nicklaus’ relationship with Hope—the iconic comedian, actor, singer, and TV star—blossomed into a close friendship. Long before it was the CareerBuilder Challenge, this week’s TOUR stop was played as the Bob Hope Desert Classic—allowing Hope, a man of all seasons—to delve deeper into his athleticism and love of golf. The legendary performer was also the tournament’s indelible master of ceremonies. Nicklaus sat down this week and looked back on his victory in 1963, and how the five-round format tested his tolerance of pain that resulted from a left hip injury suffered on the final hole of a pro-am round in San Francisco the week prior. It was his fourth win on TOUR behind his 1962 victories in the U.S. Open, the Seattle World’s Fair Open Invitational, and the Portland Open Invitational—and it was an important milestone in Nicklaus’ record-setting career. The result at Augusta National, and just eight weeks after winning in the desert, was the first of the Golden Bear’s record six Green Jackets. “Palm Springs was a big swing in my life and in my game,” he said. Nicklaus won five of the first six tournaments that Argea caddied for him—but he remembers the Hope being among the most fun events of the year. From 1965 to 2011, Hope’s name graced the tournament and his presence could always be felt. America’s biggest names, from presidents to celebrities to the pros, would come out to the Coachella Valley for great laughs and, sometimes, better golf. The modern CareerBuilder Challenge remains true to its fun beginnings—but with an even greater focus on competition. This week’s field includes former PGA Champion and 2017 Memorial Tournament winner Jason Dufner, and 2016 Jack Nicklaus Award winner and PGA TOUR standout Jon Rahm. It’s also where 2016 FedEx Cup Playoff event winner Patrick Reed and five-time major champion Phil Mickelson made their 2018 season debuts, after both appeared on the winning U.S. Presidents Cup squad in 2017. Also in the field are major champions John Daly, Webb Simpson, Bubba Watson, and Mike Weir. Live TV coverage is Friday through Sunday from 3:00 to 7:00 p.m. ET on Golf Channel, with a live stream also available online on nbcsports.com. The CareerBuilder also elicits fond memories of the Golden Bear’s other legendary career—as one of the world’s most heralded and sought-after course designers. The Nicklaus Tournament Course at PGA West opened in 1987, is ranked one of the Best Resort Courses in 2017 by Golfweek, and is a 10-time host of the event. Beauty and drama permeate the masterful design. Around every corner you will find a new challenge, including the rare feature of two island greens. 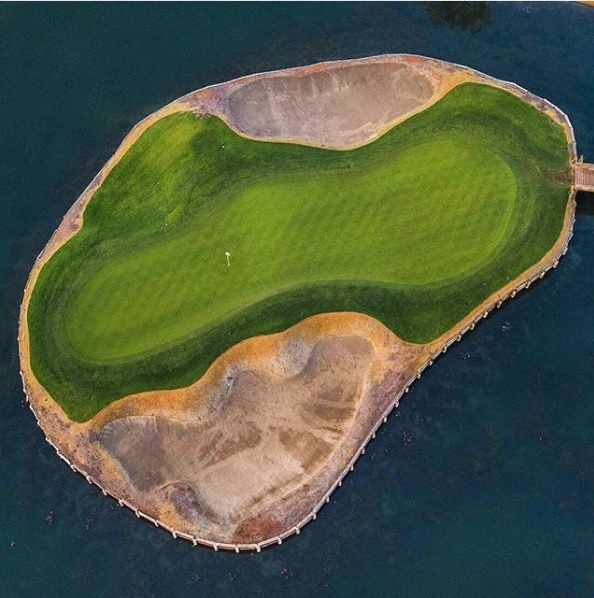 At 7,204 yards long, the Nicklaus Tournament Course has a stroke rating of 75.3 and a slope rating of 143. On the eve of the first round, Nicklaus’ design had Rahm feeling the most confident out of the three layouts. “All three are outstanding courses and in amazing shape this time of year,” the 23-year-old said. “This area, the courses are always in really, really good shape, so it’s tough to pick one, but because I’m familiar with it, I would say the Nicklaus. This would be about my ninth round on this golf course, so I know it pretty well. But again, I feel like any other person, when you have a good day, any course is fit for you. It’s about making good shots.